A title of a report whether it be on education, or other subjects, is often the spur to sit down and begin reading in anticipation of learning something new or being brought up-to-date. So it was with the title of this report with specific reference to the various progression routes for young people post-compulsory education. The report is interesting and helpful, though there are those experienced in the world of education who may view the report as restating familiar practices, successful or otherwise. This is not necessarily a criticism; it is always useful to reflect on the degree of implementation of earlier Welsh Government initiatives. It’s just a thought, though, whether the report’s recommendations will have greater substantial influence on respective Welsh Government personnel if more of those consulted were working in an FE college. Of the 60 listed as being consulted, in the appendices, just 4 are working in an FE college (Wales). Not one of the 18 consulted in Scotland was an FE practitioner. I can understand the need to consult with those in senior positions and policy makers, but of course FE teachers and managers will have similar and other perspective on curriculum change, implementation and consolidation to those not employed by FE colleges. I acknowledge though that others were consulted in addition to those listed. On other matters the report in the Foreword begins with ‘Curriculum reform is something that typically only occurs once every generation, which means there is no simple blueprint to follow or very little expertise in how curriculum reform should be undertaken’. This assertion might be readily accepted, and I do in part, in respect of the essence of substantive curriculum reform, but to follow through on the assertion… very little expertise in how curriculum reform should be undertaken’ is a moot point. There is considerable curriculum reform expertise within FE, though not as extensive, I agree, as that needed to implement successfully the recommendations of this report as they relate to Successful Futures by Professor Graham Donaldson; but the expertise I refer to in FE is gained from implementing, close on, 20 Welsh Government related further education curriculum policy reports, since the creation of the Assembly. You note that the ‘technical language often used within curriculum reform was seen as a significant barrier to businesses understanding what curriculum reform meant for them and how they could contribute.’ Perhaps the following sentence is what you mean as an example of ‘… technical language…’ Any new accountability framework will be subject to challenge and critique, and it is vital that it is developed in a transparent, collaborative manner that is accessible to all partners, not just those involved in compulsory education. It needs to build a shared understanding of the nature of the journey that implementation will take and what meaningful progress looks like. Notwithstanding my remarks, those experienced in the world of education ( all sectors, management, policies, teaching…) I’m sure will find the report useful, for it is always helpful to be reminded of lessons learned from the past along with new insights in the context of current Welsh Government priorities. However in ending this commentary, it is revealing to note your finding that, ‘It was interesting to hear that although some people felt informed and engaged about curriculum development, this was not the case for everyone, even within the same sectors, illustrating that communication and space for engagement remains a key challenge. For example, within the further education sector, only those that sat on the AoLE (your acronym) groups tended to report they felt more engaged and informed whereas the rest of the further education sector reported feeling less so.’ This is a most crucial remark in respect of previous Welsh Government curriculum initiatives and reinforces directly several of the report’s recommendations. Hello Brenig, thank you for your comment and detailed read of our report. You’re absolutely right – our report targets the further education, higher education, skills and business communities, along with Welsh Government, and so part of our approach was to present information which will already be very familiar to those in the education community to a different audience. We hope that it brings all these sectors up to speed with what is happening and encourages debate. We acknowledge that there are many other voices that need to be heard, beyond those that we spoke to. However, the resources available to the project – time, staff, and money – meant we had to make tough choices and so prioritised speaking to those listed in the report. As you mentioned in your comment, and as we highlighted in our report, we recognise that all these communities, including the further education sector have a lot of expertise and experience to offer towards the development of Wales’ new curriculum and hope that this project catalyses these discussions. 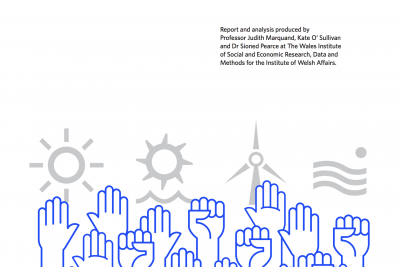 We offer the report in that spirit – that it’s the start of a much wider conversation across Wales. Thank you Halima for writing to me. Explaining your intention, the purpose of the project and recommendations, provides a necessary critical prompt to review my comments in a fresh policy context. It serves to be reminded that I retired from full-time FE 11 years ago. I wish you well, and others, in assisting the further development and implementation of the curriculum reforms through the report’s recommendations.